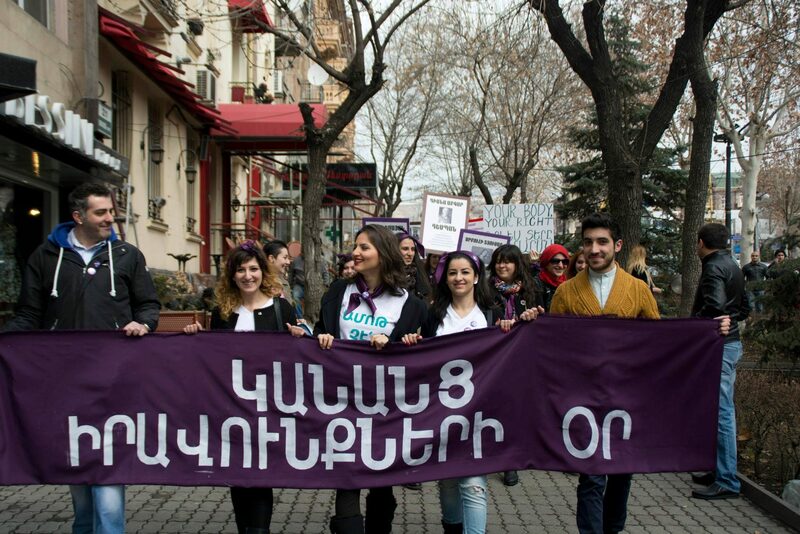 Kvinna till Kvinna has supported women’s rights in Armenia since 2004. Political and economic inequality persists in Armenia, and many women have difficulties accessing health care. Women are also largely excluded from peace talks on the Nagorno-Karabakh conflict. Our partners promote women’s political participation, raise awareness of women’s rights and offer free health care. Armenia and Azerbaijan have been in conflict over the Nagorno-Karabakh region since the dissolution of the Soviet Union. A ceasefire was negotiated in 1994, but no lasting peace has been reached. Peace talks so far have been conducted almost entirely by men. Politically, women are poorly represented in Armenia. Only 9% of seats in parliament are held by women, despite a law stipulating at least 1 in 5 electoral candidates should be female. Economically, there is no right to equal pay for equal work. Many women work both multiple jobs and shoulder the full burden of housework and childcare. Still, they earn just half as much on average as Armenian men. Maternal mortality rates in Armenia are eight times the EU average. Knowledge about SRHR is poor, and selective abortion of female fetuses a common problem. The majority of Armenians – especially rural women – struggle to access health care. Nationalism and heavy militarisation have entrenched traditional gender roles in society. Because of this, women’s rights activists and pacifists are often unpopular and face regular threats. For years, Armenia did little to prevent violence against women – despite it being a grave and widespread problem. Our partners lobbied for years to change this, united under the umbrella of the Coalition to Stop Violence Against Women. In 2017, their work paid off: Armenia finally adopted a law against domestic violence! In April 2018, massive street protests forced Armenia’s long-term president from power in a peaceful “Velvet Revolution.” So far, the revolution appears to have had positive consequences: one of the key priorities of the new interim government is strengthening women’s political participation. It is still early days for post-revolution Armenia, but both civil society and the general public have high hopes for a democratic future.